MYTHS and LEGENDS: The art image for today's legend shows Phaethon, and there are more images here. TINY PROVERBS: Today's tiny proverb is: Patientia vinces (English: By means of patience, you will triumph). PROPER NAME PROVERBS: Today's proper name proverb from Erasmus is Daedali alae (English: The wings of Daedalus... on which he famously made his escape King Minos; from Adagia 3.1.65). ELIZABETHAN PROVERBS: Here is today's proverb commentary, this time by Taverner: Sub omni lapide scorpius dormit: Under every stone sleepeth a Scorpion. This Proverbe admonisheth us, that wee speake not rashely and unadvisedlie amonges captiouse and calumnious persons. For what so ever wee touch, it is to be feared that they will bite it. Now certaine it is, that the Scorpions be wonte in diverse countreyes beyond the sea, to lye lurkinge under stones, whiche stones, so sone as a man uniware, take up, forthwith he receyveth a wounde of the Scorpion. 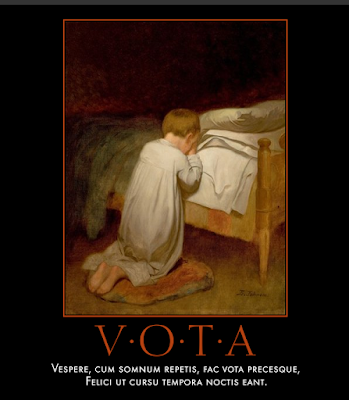 BREVISSIMA: The distich poster for today is Vesperis Vota. Click here for a full-sized view. Qui nihil audet, nihil gaudet. He who dares nothing, enjoys nothing. Audi, multa vide, multa loquare cave. Listen, observe much; be wary of saying much. PHAEDRI FABULAE: The illustrated fable from Phaedrus for today is Aesopus ad quendam de successu improborum, a story about unintended consequences: Latin text and Smart's translation. STEINHOWEL: The illustrated fable from Steinhowel for today is De cane et fure, which is another dog fable, this time about a discerning dog: Latin text and English versions.